Summer is almost here and you need some fun activities for the little ones! 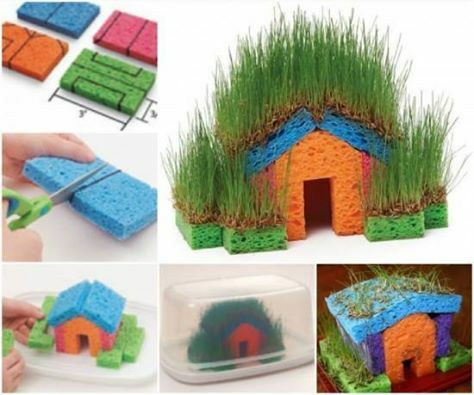 Here is a cool grass house! Here’s one building material that didn’t even occur to the three little pigs! Sturdy and quick to assemble (no glue required), this verdant cottage, which sprouts up from four kitchen sponges and a handful of grass seed, just may be worthy of its own fairy tale. Step 1:To create a good growing surface, rinse the new sponges by holding them under running water and squeezing a few times. Let the sponges dry slightly. Step 4:Inside the upturned lid of the plastic container, assemble the house. Step 5:Spray, but don’t soak, the house with water. Then sprinkle a generous layer of grass seed evenly over the roof and the yard. If any seeds roll off the roof, pick them up with dry hands and patch the bare spots. Finally, very lightly spray water over the seeds with an upward spray motion. Step 6:Keep the house moist, warm, well lit, and covered until the grass is growing well, about two weeks. To prevent mold, leave the plastic cover slightly ajar or poke a few holes in the top. When your grass looks as though it could use a mowing, you can remove the cover. With regular watering, your house can grow for several weeks.